Supported hike from Green Cape Lighthouse to Boyd’s Tower. A night in the beautifully renovated Green Cape Lighthouse Cottages. Luxury camping at Saltwater Creek, with hot showers, comfy beds, ensuite tents, cooked meals. $1,100 per person, twin share. $1,400 per person, single tent. TOUR GUIDE: Additional $400 per group per day. The Light to Light Walk, comfortably. This tour was specially designed for the cooler months, but it’s great any time of year for folks who want to enjoy both an outdoor camping experience, and a night in the wonderful Green Cape Lighthouse Cottage. It’s spectacular any time of year, but winter is a great time to walk the Wilderness Coast. The temperatures are pretty mild, with daytime temps averaging between 15-18°C. And while the nights get cool, that’s the perfect time to enjoy a roaring camp fire, your own private hot shower and luxurious beds, sheets and sleeping bags. We’ve even got hot water bottles to keep your toes warm. Plus, you’ll avoid any crowds, and have the isolated, pristine beaches and stunning headlands to yourself. Located in Ben Boyd National Park in Australia’s Coastal Wilderness region, the 31km track passes rock dating back over 400 million years, a marine environment with incomparable diversity, coastal heath and forests of Banksia and Ti-tree. Use the contact form at the bottom of the page. You’ll hear back from us within 24 hours. 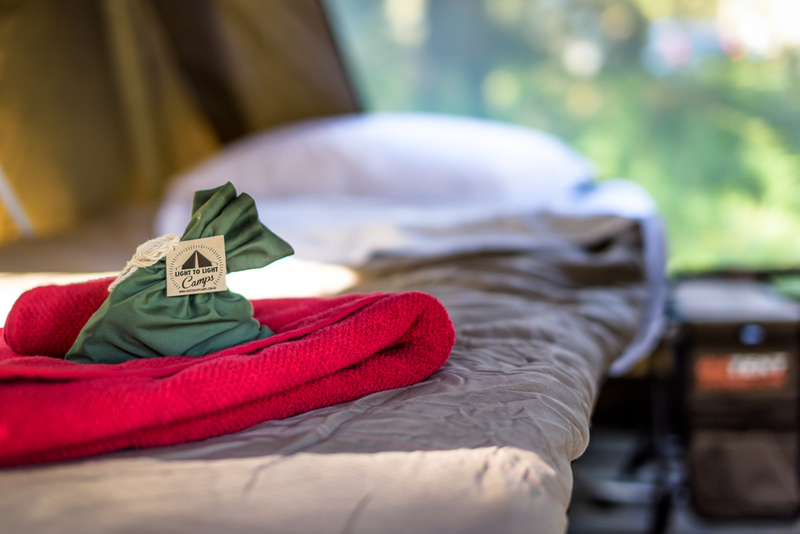 Wilderness with luxury – we carry your gear, set up your tent, ensuite camp shower and camp beds. Memory-foam mattresses, percale sheets, luxurious sleeping bags, pillows and towels. First night in the beautifully renovated Green Cape Lighthouse Cottages. The best outdoor recreation gear, including Suunto GPS equipment, OzTent tents, sleeping bags and beds, and Mont backpacks. We’ll pick you up from your local accommodation just after lunch, and drive out to the remote and wonderful Green Cape Lighthouse, where we’ll stay overnight in the beautifully renovated Cottage 3. You’ll enjoy a tour of the Lighthouse and surrounding features such as City Rock, Pulpit Rock and the Ly-Ee-Moon cemetery before retiring to the cottage for the evening. You’ve got a 17.4km trek ahead of you – so we’ll get you up and fuelled with a delicious breakfast fairly early. Expect to be fed and dressed, armed with your freshly packed snacks and lunch, and on the track before 8 a.m. This first section of the Light to Light Walk (heading north) will take you firstly through some low heath – look out for the rare Eastern Ground Parrot or the ears of a kangaroo here. You’ll then move through some shady ti-tree forest (we’ve seen an equally rare juvenile Rose-crowned Fruit Dove here!). Pass by Bittangabee Bay – you can walk via the ruins and the beach. Cross expansive red rock platforms, before moving into more heath, paperbark and ti-tree. Watch out for wallabies and goannas. You’ll know Saltwater – come down a small hill and see the stunning white surf beach in front of you. Your campsite is right behind the beach. Enjoy a hot shower, a warm campfire and a delicious meal – all set up and prepared for you by us. The cosy, luxurious beds are rated to below zero temps and we’ve even got hot water bottles to keep you toasty. Breakfast by the campfire while we prepare your lunch, and off you go again. This walk is 13.7 km (add extra for detours for photos!) of the most spectacular coastline you are ever likely to encounter. Mind-blowing beauty, rugged red rocks and sapphire waters. Clean and remote beaches. Be ready to be impressed. Make sure you’ve got ample space on your camera card. We will be waiting for you at Boyd’s Tower, a local gem of a place that you’ll be at your leisure to explore. The tower dominates a landscape that takes pride of place in everybody’s holiday album. Unique and ancient geological features, big kelp forests swaying along the intertidal zone and an impressive diversity of birdsong. Relax those weary legs as we take you and your gear back to your accommodation in Eden, Pambula or Merimbula.